It is possible to build daily habits that guarantee to give you higher ranking and greater marketing success. Neil Patel lists 5 daily habits you can (and should) start doing if you want your rankings to go up and get more results out of your content marketing efforts:1. Write and publish one article – 1 hour per day for 1 to 2 articles per week.2. Update one old article – 10 min per day.3. Post a link to an article on every social media platform – 5 min per day.4. Interact on one forum – 10 min per day.5. Reply to one Tweet, Google+ update, Facebook post, and LinkedIn discussion, etc. – 10 min per day.He explains exactly why you should get these 5 habits to ensure you greater results in your content marketing strategy and then gives you practical insights on how to master those habits.This list is great and I try my best to spend about an hour doing them every day, simply because they do work. Given our experience, I’d like to talk about a sixth practice that has had a real impact on our content marketing ROI, and that I’m sure Neil would like. 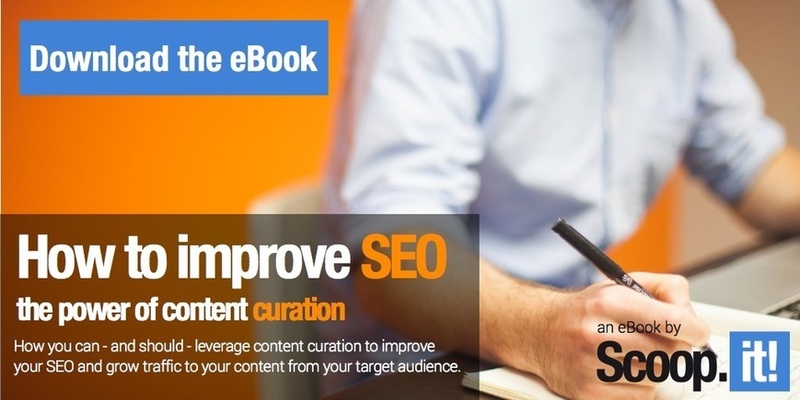 It’s content curation. Let me know Neil! Time required: 20 minutes. For one blog post. For real.20 minutes a day would give you one article a day. Not too shabby heh?You don’t have to do it every day, but since it takes in average 4 hours to write a full article (in our analysis that’s the average we’ve observed even though I’m sure some people can write much faster), if I spend an hour a day writing an article from scratch and the last 3x 20 minutes I have in the week to curate 3 blog posts, that means I can publish 4 articles per week.Of course, just like writing, it’s not going to take you 20 minutes right away or every time. But practice makes perfect. publish more content, especially if you find yourself buried in marketing tasks and don’t have enough time to write a complete blog article every week. 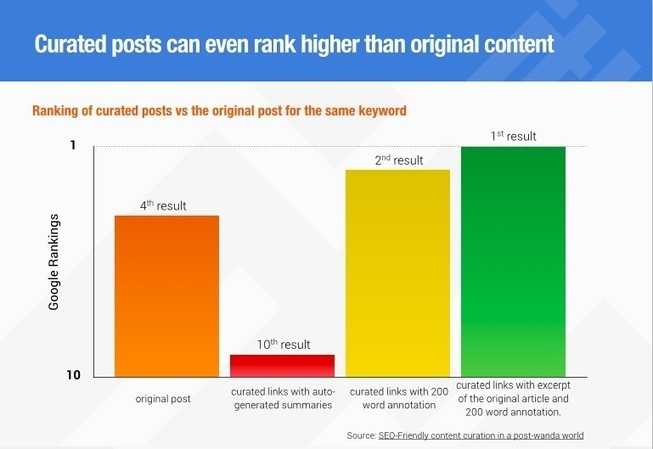 And since “businesses with websites of 401-1000 pages get 6x more leads than those with 51-100 pages” (Hubspot report), publishing more content is important. 21 Comments on "Content curation should be a daily habit for all marketers"
Julie, you mention using curation tools, but don’t discuss any specific tools. Can you make any recommendations? 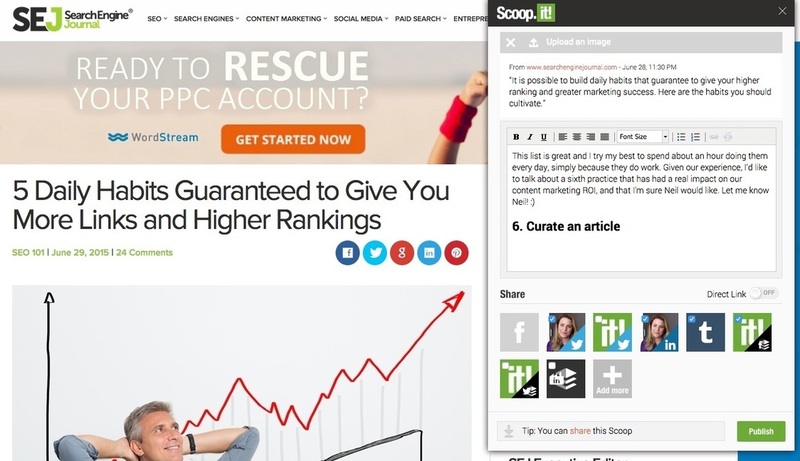 Would StumbleUpon be an example of a curation tool? I’m wondering too. Have you tried tintup.com? They have a great social media curation – curious to see how we can integrate the two. Interesting! I haven’t but I will look into it. Thing is the Scoop.it search engines searches everywhere, social media included: we can find youtube videos, pdf documents, blog articles, and we search in google, bing, twitter, linkedin, etc. I’m sure if it’s necessary though we could create an integration between both! Yes, that’s true! It really depends on what you are looking to do. I love Tint mostly because of functionalities and real-time display of all your social content in one place. 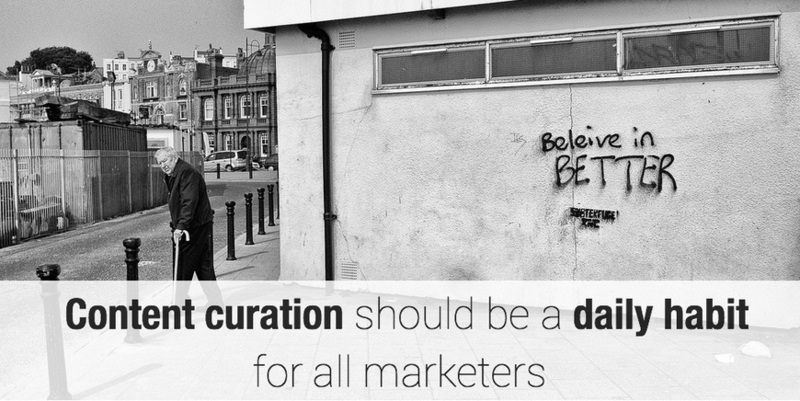 This is the first time I have heard of curation and its tools. But it does make sense. I really appreciated how you broke down your time. I do that too but it is a little longer. I am a new blogger with limited traffic, I don’t know how I could achieve this just yet. However I will keep it mind down the track. Thanks. Thanks for the response. I am at the stage where I am looking at improving my marketing techniques or lack there of. I did hit your link and it gave me the error 404 page not found. I really would like a read. I await your response. sorry about that, the link above should work now! Let me know! Your tutorial is awesome and very informative. It will help me more. Short tips but very effective. People who have blog must really learn from this post. It will surely help boost their rankings. Thank you for providing all the links. This information was solid and informative.